Something magical happens when you mix mason jars with candles. They compliment each other perfectly. They make the perfect fall decor or even a gift to give to teachers or neighbors. 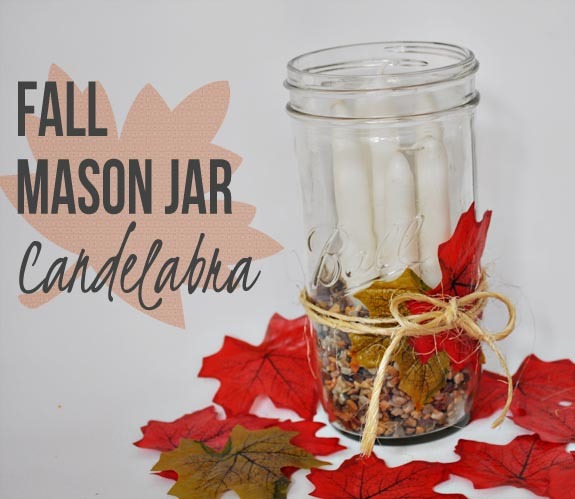 No matter what level crafter you are, anyone can do this easy fall mason jar craft and make their own Fall Mason Jar Candelabra. I love the look of candles in the fall. My mantle is currently packed with all kinds of candles such as these Dollar Store Fall Candles that I made using all dollar store supplies. During the spring and summer months in Texas it’s just too hot to even glance at a candle. That’s why when temperatures dip into the chilly high 80’s sometime in October, we pull out the candles and go to town. We’ll enjoy them for three to four months and then pack them up while pulling out the flip flops and shorts in February. Because of this Texans can’t have plain old candles. We need to make them fancy and pretty. Just because it’s fancy doesn’t mean it’s hard though. 5 minutes and you can have some lovely fall candles to compliment your home while providing beautiful dancing lights at night. 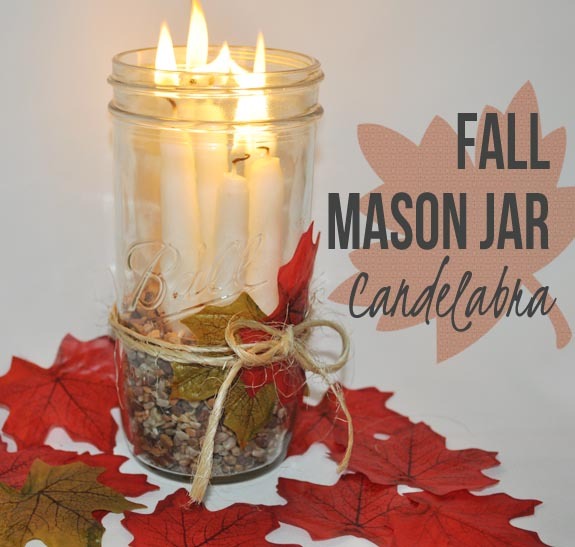 To get started all you will need is a wide mouth mason jar, 5-6 taper candles, pea gravel, fabric fall leaves, tape and twine or thin rope. 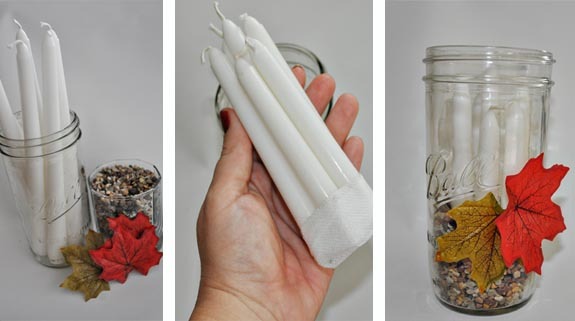 First you need to figure out how long your tallest candle should be by holding the top of the candle to the top of the jar and cutting off the end that hangs past the end of the jar with a sharp knife. Now cut each of the remaining candles about half an inch shorter than the previous candle until you have a group of stair stepped candles. When you’re done arrange the tallest candles in the back with the shorter in the front and place tape around the bottom of the candles to hold them in place. Next you simply place them in the mason jar and hold them while you pour in the pea gravel until it’s about 1/3 full. Using tape, lightly stick two of the small fabric leaves to the jar. Then wrap the twine or thin rope around the jar three times and tie a bow over the leaves. Place one on a shelf or line several up on a table for your Thanksgiving table decorations. 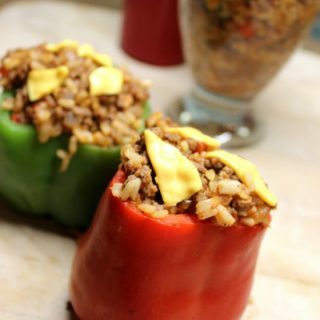 They are simple, easy to make, and pretty. What can beat that? I hope you like this craft. Feel free to stop by my blog, Clumsy Crafter to find more great ideas and easy crafts. This is a really cute and simple idea. Thanks for sharing. I’m not very crafty but even I can pull this off! We love this super easy DIY craft! This will be great as a gift or holiday decoration around the house! We will be tweeting your mason jar craft to our followers from our Twitter account. Thanks for sharing this with us and Happy Holidays!